in order that you may know that it is I, the Lord, the God of Israel, who calls you by your name. For over two thousand years there have been whispered rumors of a vast treasure hidden somewhere in Israel. Using the prophecies of Isaiah as their basis, many believe there is a cavern where a thousand golden objects – the sacred relics of the Second Temple – lay strewn about in disarray where they were hurriedly tossed the night the Romans burned Jerusalem. Television personality and antiquities dealer Brian Sadler and his wife arrive in Jerusalem and find danger and uncertainty everywhere they go. In a controversial move, the U.S. president has moved the American embassy to West Jerusalem, inciting riots and anger from the Palestinians. Brian’s colleague, a Syrian who owns a shop in the Old City, offers to show him a cache of wondrous objects, but everything isn’t as it appears. Brian questions if the treasure exists and in a dank underground room, he learns that danger and deceit must be overcome before he can learn the answer. He faces both a ruthless terrorist and someone he once trusted, both of whom want the same things he does. 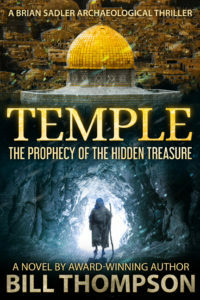 If the words of the Bible are correct and if Isaiah’s prophecy is about to be fulfilled, who will find the hidden treasure of Jerusalem’s Second Temple? An imminent war and a kidnapping put Brian’s mission in peril. It’s a race to find the relics before ISIS does, and the sacred icons are lost forever.  Archived in Books, The Brian Sadler Series.